Even if your kids don't play sports, your family calendar is probably jammed. And even if you only have one child, that calendar probably contains conflicts (the "two-places-at-once" problem). So how do you cope? Try these time management hacks to retake control of the schedule. Keep both parents, all the kids, and any additional caregivers (see below) in the loop at all times by setting up on an online family calendar, with a service such as Google, Cozi, or 30Boxes. This way anyone (with your permission, of course) can access important info, like what time practice starts tonight or who's scheduled for carpool. Check out your child's sports team's technical capabilities, too. Some leagues let you import their calendar into yours, or sign up for text alerts if there are any schedule changes. At the least, you'll want to bookmark the team's website or Facebook page. Check it regularly to make sure your info is always synced with theirs. Carpooling team: Pair up with just one other family in your child's activity and you cut your driving time in half (and maybe your waiting-around time too). Add another family or two to your carpool and you reduce your commitments even more. Do factor in a little more time for organization, though, for a bigger group; and have a backup plan in place. Caregivers: These could be paid helpers or family members willing to lend a hand, like grandparents. A caregiver could pitch in with driving, stay home with siblings, or even come along on a tournament or competition day when you'll be extra busy. At an even younger age, kids can begin to take charge of her own things — uniforms, shoes, safety gear, and so on. Gradually shift this responsibility to their shoulders as they grow. Then, when they're teens, they can begin to manage their own events on the family calendar, making choices about what they can realistically commit to. Just knowing where they need to be and when is a hugely important time-management skill for them, along with being very helpful to their parents! Scope out the neighborhood surrounding your child's sports practice or class. Is there a supermarket, discount store, or post office nearby? How about a branch of your dry cleaner, pharmacy, or bank? Planning your errands so you can hit these during down time helps you avoid an extra trip another day (and therefore saves time, gas, and money). If it's a family priority to attend church together every Sunday or to have movie night every Friday, think hard about committing to a sport that would interfere. Beyond that, be practical about costs, driving distances, and each child's other interests and commitments. Ask questions before you enroll to avoid disappointments and calendar conflicts later. If you have more than one child, there are certainly advantages to them doing the same sport or activity. Kids don't always want to compete directly with their siblings, but you may luck out with back-to-back practices or games played at the same venue. Or you may find you can hire a private coach or tutor they can share, at a time convenient to you, for about the same price as you'd pay for two separate lessons. Finally, it's good for your family calendar — but also your child's mental and physical health — to take breaks. Maybe you skip a summer sport, so you can enjoy more family time (even a vacation). Or fall, so your child can get a good start on school before adding extracurricular activities. Or spring, so you can manage all those end-of-year school events. 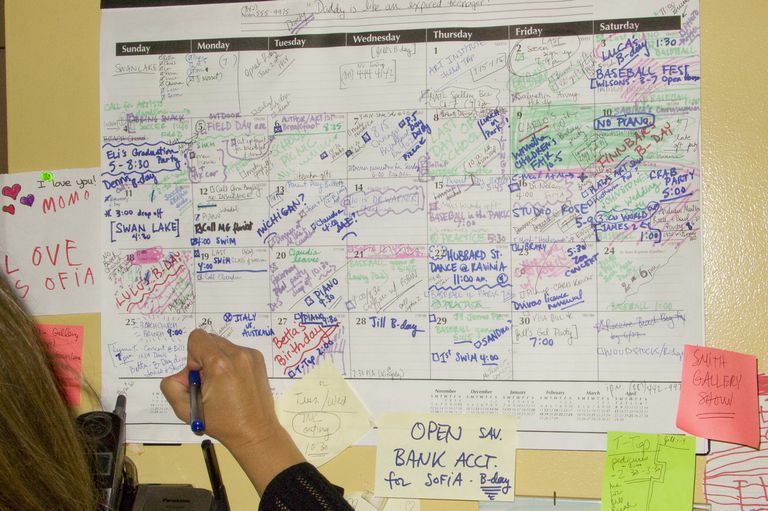 Make meal-planning a part of your family calendar management strategy. I have five ideas for handling dinner when you're never actually home at dinnertime.